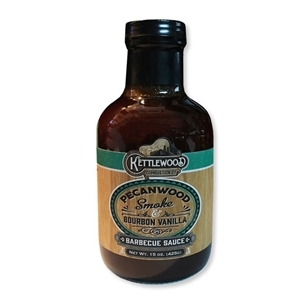 Mild and fruity, cherrywood smoke is great for smoking lighter meats. We paired this soft smoke with subtle notes of chocolate for a velvety grilling experience. Best used on chicken, turkey, fish & ham. Tomato puree (water, tomato paste), cane sugar, distilled vinegar, molasses, tapioca starch, salt, natural pecan smoke flavor, caramel color, Kentucky Bourbon, onion powder, spices, tamarind concentrate, garlic powder, vanilla extract.